David Webber, right, pictured with Jamey Spencer the Sunday after Webber was baptized at Oklahoma City, Southern Hills. For the past several years, as summer winds down and the school year is on the horizon, Oklahoma City, Southern Hills has hosted a school supply drive for local schools and families. For the past three years, David Webber, an Oklahoma City resident, brought his daughter to the event. “It’s a fun event where we get to serve our community by meeting a need, and the response is always great,” said Young Adult Pastor, Daniel Snow. Webber and his daughter did not attend church at Southern Hills, but while Webber became increasingly interested in the church, he hadn’t taken the plunge of visiting—yet. Frequently, as Webber played the popular game “Pokemon GO,” he found himself in the church’s parking lot, where one of the stops for the game is located. This fueled his curiosity about the church. In the weeks following the school supply drive, members of Southern Hills contacted Webber to invite him to church. “About a week after the drive, our church did a church-wide follow up with several hundred families that received supplies,” said Snow. So one couple reached out to Webber and his daughter, asking if they could visit them at their home. They accepted. Another way church members were able to reach out to Webber was with a handwritten letter. Jamey Spencer, a senior adult who attends Southern Hills expressed in her note to Webber how glad she was that Webber and his daughter had attended the event, as well as expressing how she thought Webber’s daughter would enjoy the children’s ministry. She even said that there were things for adults to enjoy at the church too. Webber was touched by the personal nature of a handwritten note. Then, once again he found himself again in the parking lot while playing Pokemon GO. He wanted to go inside and talk to someone, but was hesitant. So he thought maybe he would turn the music in his car up so someone would come outside and ask him to turn it down, then he could talk to them. However, Senior Pastor Doug Melton happened to be in the parking lot, and stopped by Webber’s car to see if there was anything that he could do for him. This began the conversation Webber wanted to have. The two began talking about the Lord and the Gospel and after a good conversation in the parking lot, they went inside the building to talk to more staff members. 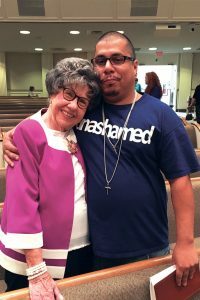 “Doug brought me into the conversation and we got to stay and chat for quite a while after that about repentance and drawing near to the Lord again,” Snow said. It was at the response time that Webber came forward and confessed to already being a believer, but said he wanted to draw near to the Lord again and follow through with believer’s baptism. The next Sunday Webber met Spencer, the woman who wrote him a handwritten note. Now, Webber and his daughter attend Southern Hills often—which has led to his daughter having questions about the Gospel. “It’s neat because there have been different people in our church body that have begun to build relationships with David and his daughter and they’re really plugging in,” Snow said. Through one church outreach program the lives of Webber and his daughter have been forever changed. Snow said it’s refreshing to see this kind of result from an event that has been hosted by Southern Hills for many years. The fruits of the labor of planting seeds many years ago through a school supply drive are now being enjoyed by many.